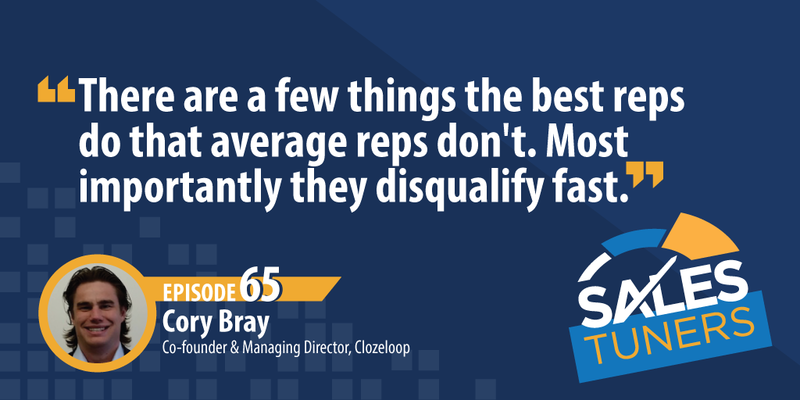 Cory Bray, Co-founder and Managing Director at Clozeloop, was fired by his sales coach at his last job. Now they’re business partners helping organizations enable sales. Cory looks to achieve board level goals by uncovering opportunities for improvement and aligning daily activities. After starting his career in finance and operations, one of his mentors told him he would fail if he didn’t learn how to sell. So that’s what he did. He learned the process of sales and capitulated his knowledge into a book he co-authored, The Sales Enablement Playbook. In the age of information overload, Cory talks about simplifying sales knowledge to avoid complicating the conversation. Too often sales rep focus on the product and not the problem the customer is trying to solve. Develop your Persona/Pain/Feature Content Matrix: Think through each persona you sell to. What pain or pains do you solve for that specific type of person or company? Then list out the features of your product that directly correlate to that pain and that person. Lastly, determine what content and stories you have that match all of the above. Don’t Conflate Sales Training with Sales Coaching: A good sales trainer can teach you what to do. A great sales coach can help you understand how to do it, but even more importantly, why you should. Take for instance prospecting, through training, I can teach you what to do all day long. But, it’s not until you actually try to apply it that real learning begins. Then, you bring it back and we adjust based on our findings. Write it Down: You can call me old school, but I still believe in physically writing things down. Regardless of whether you do it manually or digitally, reading over your notes helps you understand what you think you heard versus what was actually said. Recording calls is great for verbatim recognition, but your notes are what determine how well you actually understand something and/or what you think is important. What if every sales rep inherited the habits of your best rep? With Costello, they do. The pipeline-centric system is strategically buil t on a proven selling methodology that keeps teams focused on the only thing they can control in sales – actions that push deals to close. I’ve led two companies from $1 million to more than $10-million, and one from $1-million to bankruptcy. Today, I work with entrepreneurs who don’t realize they are the VP of Sales as well as individual salespeople to 10X their revenue using a proven, step-by-step, sales methodology. Copyright © 2019 · Sales Tuners, LLC. All rights reserved.